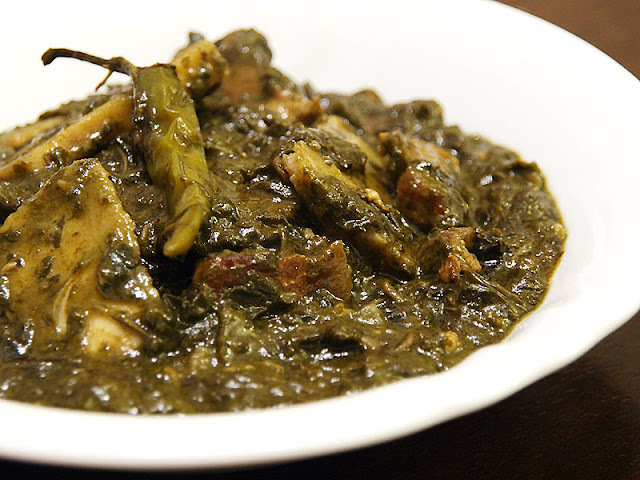 A popular dish in the Bicol region where spicy foods are common. It is believed that taro leaves should be placed in a pot and not stirred. Instead, they should be simmered gently, as stirring would cause the leaves to be very tart, meaning the leaves would bite the tongue. Chard or spinach make good substitutes. 1 Slice the taro leaves or spinach coarsely into lengths and set aside. 2 Simmer the pork, ginger and thin coconut milk in a saucepan over low heat until the meat is cooked, about 7–10 minutes. Add the shrimp and fermented shrimp, and simmer for another 5 minutes. 3 Add the taro or spinach leaves, chilies and thick coconut milk, and simmer for 3 minutes or until the leaves are wilted and the oil separates from the milk. Season with the salt and pepper. Remove from the heat and serve immediately.